1850s autograph album that belonged to Sarah E. Corliss of Salisbury, Massachusetts, with most of the autographs collected from her fellow students and, presumably faculty, at the Putnam Free School at Newburyport, Massachusetts. 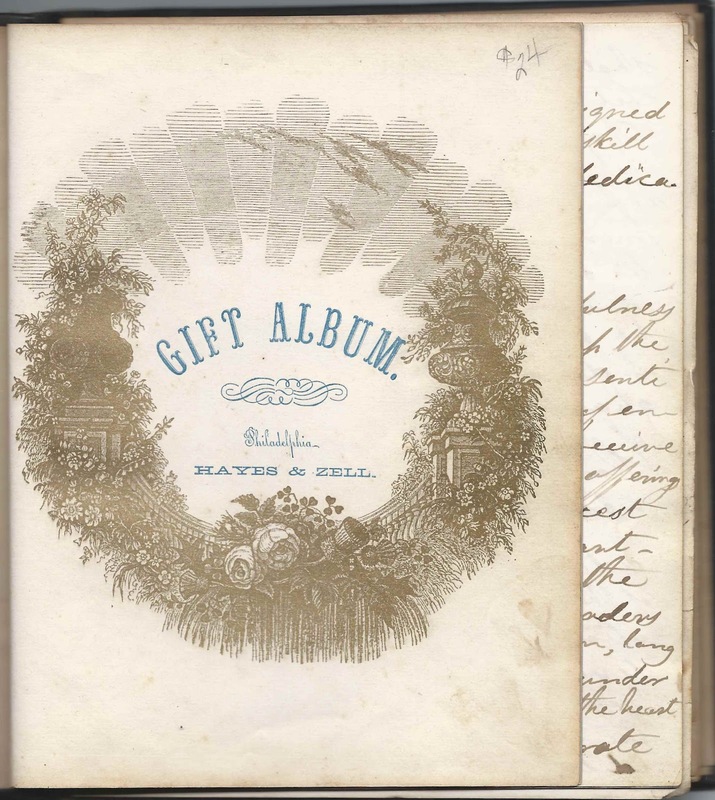 See another post that features the 1857-1872 autograph album of Putnam Free School student Martha Ellen Jackman of Newburyport. Sarah's identity is based on a lined scrap of paper inserted in the album with the name of Sarah E. Corliss on it, and the fact that most of the autographs were inscribed to Sarah. The paper may have been meant for a school exercise. 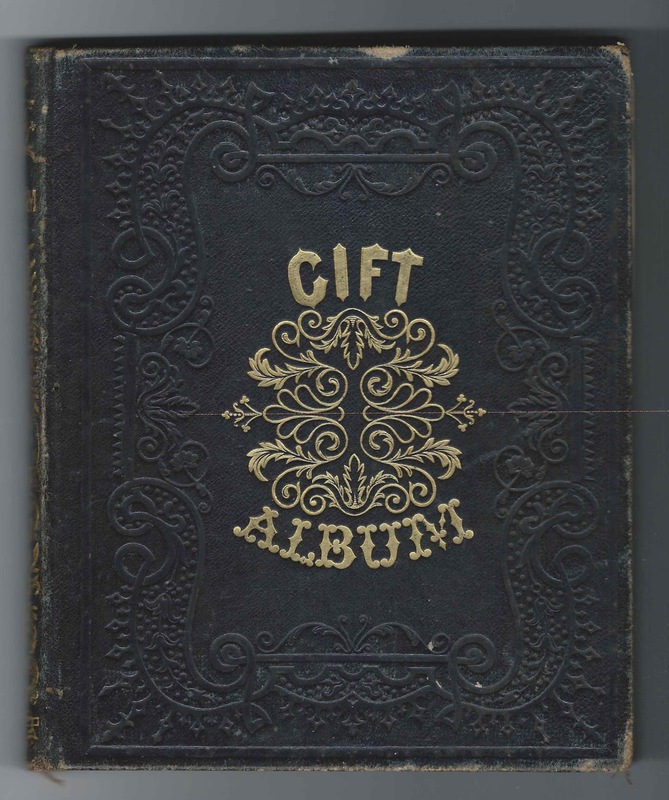 The album measures approximately 7-3/4" x 6-1/2" and is rather thick; it contains the sentiments of over 80 of Sarah's friends and schoolmates, many of them from the Class of 1858 at the Putnam Free School, which was apparently Sarah's class. An alphabetical list of the signers appears at the end of this post, along with any information about their residence or graduating class. 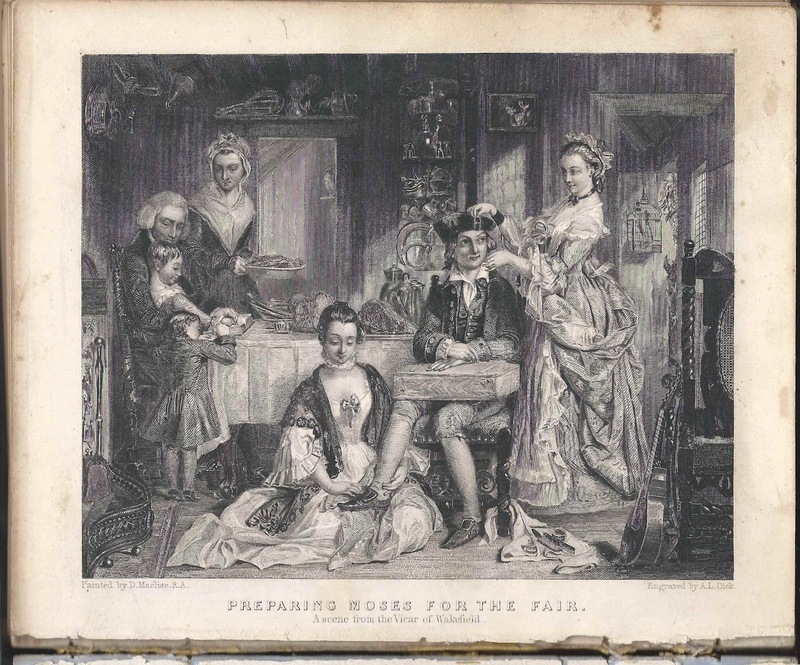 Beautiful engravings are scattered throughout the album, printed by the firm of Hayes & Zell of Philadelphia, Pennsylvania, though an error in production has some of their accompanying information running off the bottom of the page. 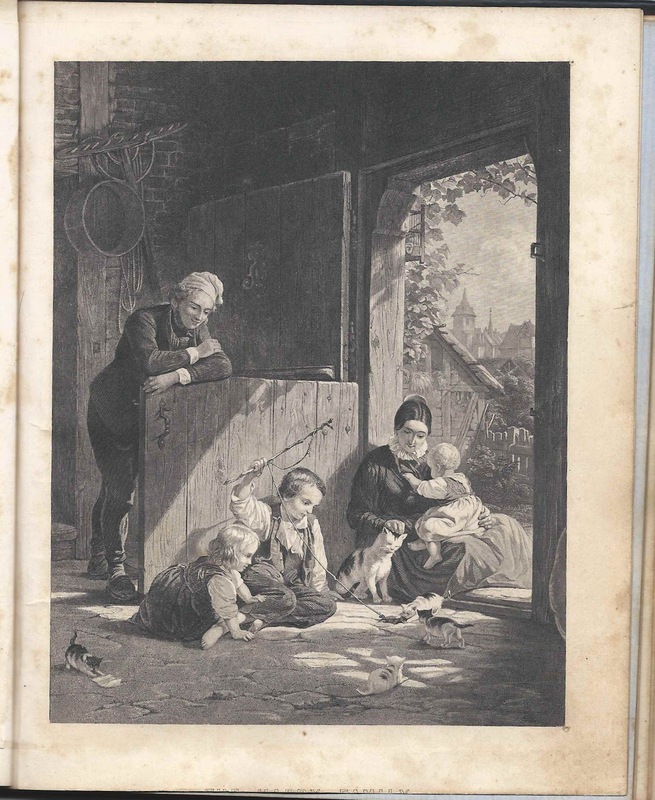 Just barely visible in the example below is the title "The Happy Family". Interestingly, Sarah added notes to many of the pages, indicating that the signers were in her class or adding their surname if they signed only with initials, or adding their residences. The first signed pages in the album are a three-page dedication to Sarah, penned on December 24, 1856 at Salisbury, Massachusetts, by Rev. Bohan Prentiss Byram, Sarah's pastor. In the 1860 Census of Salisbury, Massachusetts, the Byram and Corliss families were shown to be neighbors. Sarah E. Hanson Corliss was born 19 February 1842 at Salisbury, Massachusetts, the daughter of Jonathan and Hannah Little (Rand) Corliss, who were born at Orange, New Hampshire, and Newbury, Massachusetts, respectively. Their firstborn was an earlier Sarah E. Corliss, who did not survive infancy. On 21 November 1867 at Salem, Massachusetts, Sarah married Thomas Bowman, a Scottish immigrant and son of Alexander and Lillian Bowman. He may have been the Thomas Hamilton Bowman who died at Philadelphia, Pennsylvania in 1907. Sadly, despite all the promise in the autograph album, Sarah's was not to be a happy life. Presumably as a result of complications from the birth of her daughter, Sarah Emery Bowman, born 7 November 1868, Sarah E. Hanson (Corliss) Bowman died on 15 November 1868, at Salisbury, Massachusetts. In another blow, the child Sarah Emery Bowman died on 30 July 1869. An "Owed" to Sarah, signed at Amesbury, Massachusetts, on August 11, 1863, possibly by a John. There was a John Dodge who signed the right facing page, but I don't know if they were the same person. Carrie, signed at Putnam Free School on July 1, 1858, Class of 1860. It looks as though Sarah E. Corliss wrote something, perhaps giving Carrie's surname, but it's very faint; possibly the surname French. Sarah Lizzie, signed at Putnam Free School on December 29, 1856. Sarah E. Corliss' note: "Bartlett", so presumably the signer was Sarah Lizzie Bartlett. J. E. Bayley of Byfield, Massachusetts, signed at Putnam Free School at Newburyport, Massachusetts, on March 13, 1858. Sarah E. Corliss' note: "1858", meaning, presumably, that the signer and Sarah were in the Class of 1858 together. Maria, signed at Newburyport, Massachusetts, on December 29, 1856 at Putnam Free School. Sarah E. Corliss' note: "Brockway"; presumably the signer was Maria Brockway. May B., signed at Putnam Free School on July 14, 1858. Sarah E. Corliss' note: "Buswell", meaning presumably that May B. was May Buswell. She shared the page with Horace Choate. Rev. Bohan Prentiss Byram, signed at Salisbury, Massachusetts, on December 24, 1856. 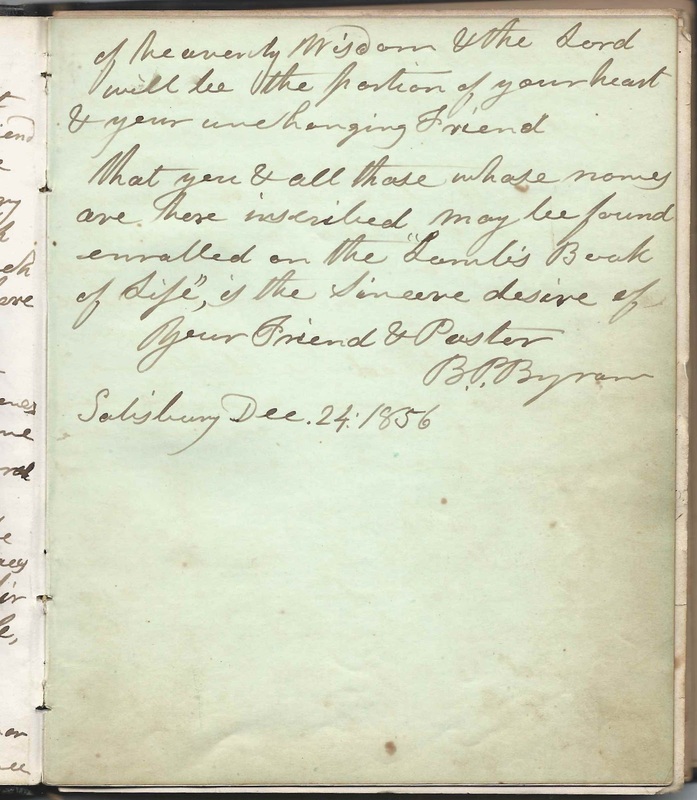 It appears that it was he who presented the album to Sarah as her pastor; he wrote a three page dedication. Horace Choate, signed at Putnam Free School on January 6, 1857. 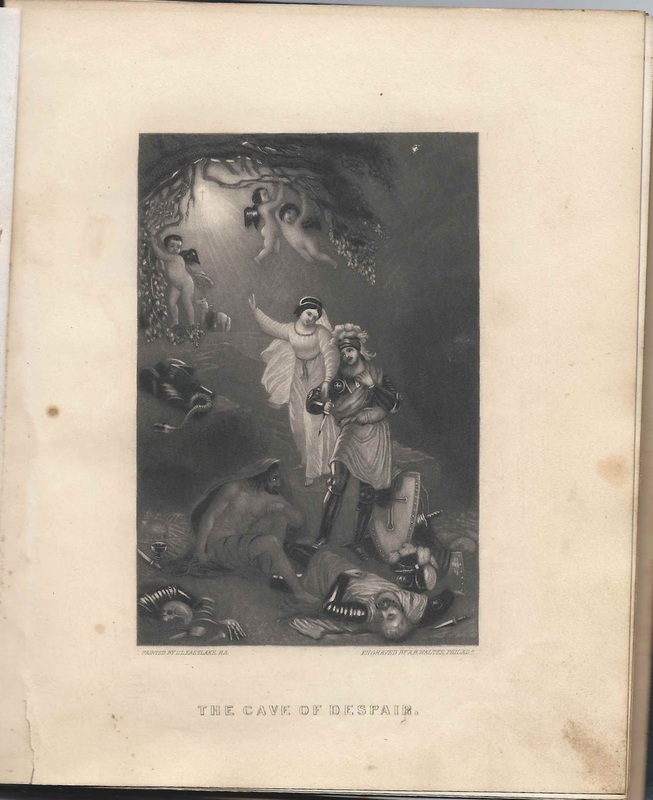 He shared the page with May B., who was presumably May Buswell. Sarah, signed at Salisbury, Massachusetts, on September 4, 1857. Sarah E. Corliss' note: "Clark", so the signer was presumably Sarah Clark. Susan. Sarah E. Corliss' note: "Clark", so presumably the signer was Susan Clark. Sarah E. Corliss of Salisbury, Massachusetts; album owner, with many autographs from fellow students at Putnam Free School at Newburyport, Massachusetts. Sarah wrote her name on a piece of lined paper found inserted in the album. Mary A. Currier of Salisbury, Massachusetts, signed at Putnam Free School on June 2, 1858. Sarah E. Corliss' note: "1858", meaning, presumably, that Mary was Sarah's classmate in the Class of 1858. John W. Dodge, signed at Putnam Free School at Newburyport, Massachusetts, on September 18, 1857. Did he write the "Owed" on the left facing page in 1863? Annie E., signed at Putnam Free School on December 29, 1856. Sarah E. Corliss' note: "Fifield", so Annie E. was presumably Annie E. Fifield. 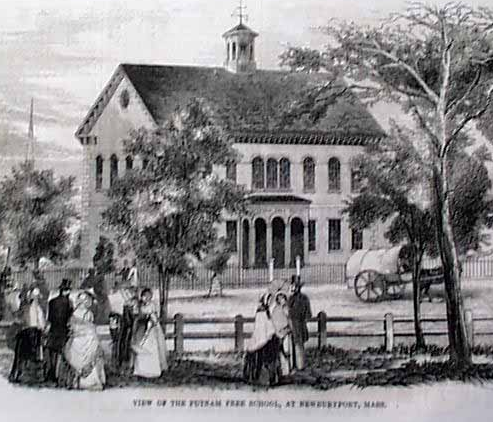 Benjamin F. Greeley, signed at Putnam Free School at Newburyport, on June 1, 1857. Sarah E. Corliss' note: "1858", meaning presumably that Benjamin was in the Class of 1858. W. H. H. Greenleaf, signed at Putnam Free School at Newburyport, Massachusetts, on July 8, 1858. Sarah E. Corliss' note: "1858", meaning, presumably, that the signer was in the Class of 1858 with Sarah. W. H. H., signed at Newburyport, Massachusetts, in November 1857. Sarah E. Corliss' note: "Hamblet", so presumably William Henry Hamblet. Initials hard to read, but possibly J. R. H. Sarah E. Corliss' notes: "Written in the cars when in motion?" and "Huntington", meaning, presumably, that the signer's surname was Huntington. Hattie M. Longfellow of Byfield, Massachusetts, signed on February 24, 1857. Sarah E. Corliss' note: "1858", meaning, presumably that Hattie and Sarah were in the Class of 1858 at Putnam Free School together. Martha A. Lowell of Salisbury, Massachusetts, signed at Putnam Free School on July 13, 1858. Sarah E. Corliss' note: "1858", meaning, presumably, that Martha and Sarah were classmates in the Class of 1858. Fanny M. of Elizabeth, Illinois, signed at Putnam Free School on December 30, 1856. Sarah E. Corliss' note: "Marshall", so the signer was presumably Sarah M. Marshall. P. A. Merrill of Newburyport, Massachusetts, signed on January 3, 1857. Sarah E. Corliss' note: "1858", meaning, presumably that the signer and Sarah were in the Class of 1858 together. Maria A. Morse, signed at Putnam Free School on July 2, 1858 - a reader believes that Maria was the Maria A. Morse from Phippsburg, Maine, and has more information if anyone is interested. 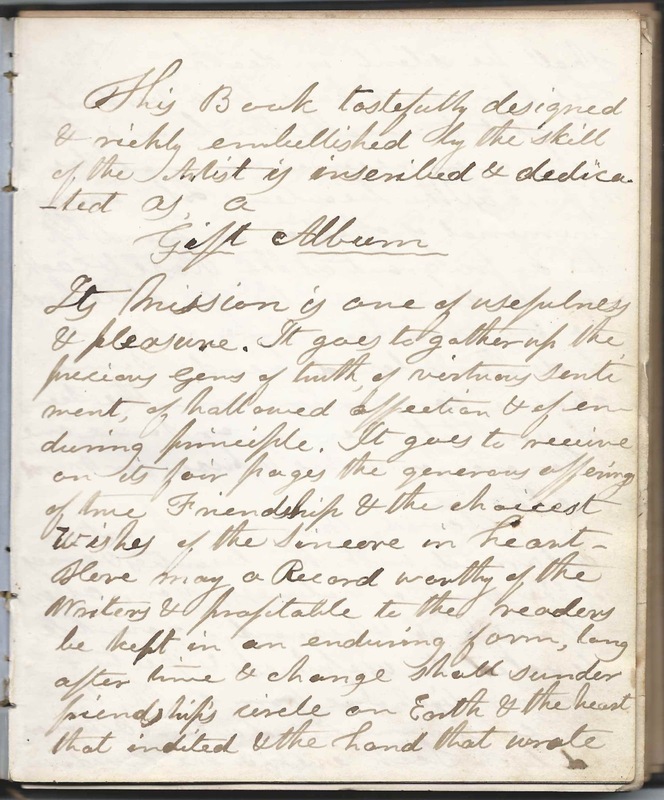 The Phippsburg, Maine, Maria inscribed a page in the autograph album of another Putnam Free School student - Martha Ellen Jackman. Eliza Philbrick, signed at Putnam Free School on December 26, 1856. Sarah E. Corliss' note: "1858", so presumably Eliza was in the Class of 1858 with Sarah. C. A. R. H. Sarah E. Corliss' notes: "1858" and "Roafe", meaning, presumably thatthe signer was C. A. Roafe, whose husband was Mr. H., was in the Class of 1858 with Sarah. 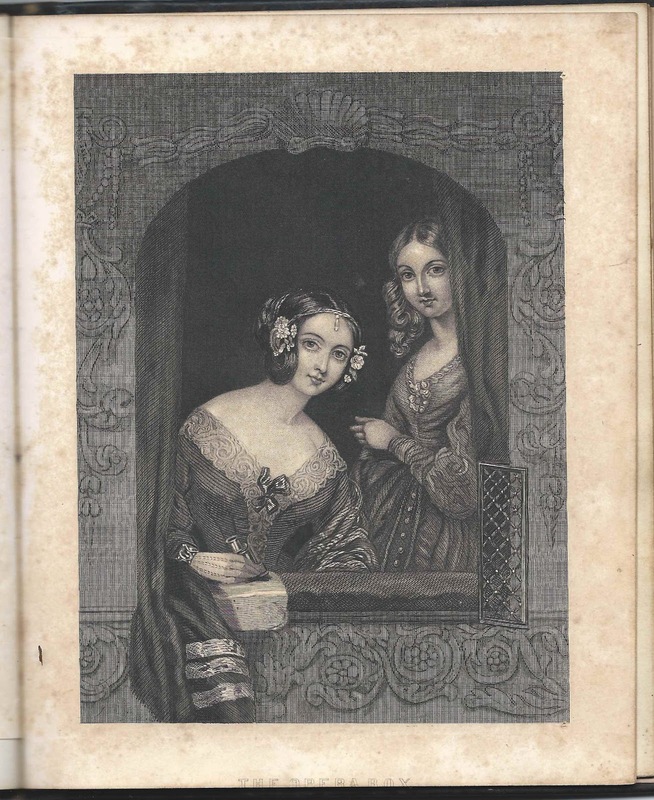 Shared the page with Eliza M. Clark. J. O. Rodgers, signed on February 26, 1857; Sarah's schoolmate. Sarah E. Corliss' note: "1858", meaning, presumably, that the signer and Sarah were in the Class of 1858 at Putnam Free School together. Angie A. Root of Byfield, Massachusetts, signed at Putnam Free School of December 26, 1856. Presumably Angeline Allen Root. Sarah E. Corliss' note: "1858", meaning presumably that Angie was in the Class of 1858 with Sarah. Mary, signed on September 5, 1857. Sarah E. Corliss' notes: "Rowell" and "1858", meaning, presumably, that Mary was Mary Rowell in the Class of 1858 at Putnam Free School. Julia M. Scott, signed at Putnam Free School in January 1857. 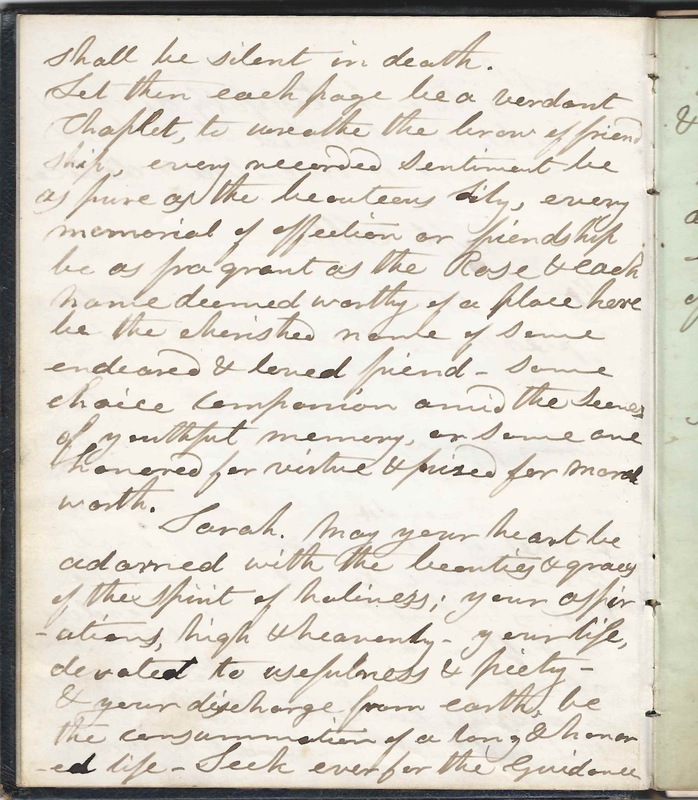 Sarah E. Corliss' notes: "1858" and "Salem, N.H.". Presumably Julia M. Scott lived at Salem, New Hampshire, and was in the Class of 1858 with Sarah. Louise H. Scott, signed at Putnam Free School on December 30, 1856. Sarah E. Corliss' note: "Salem N.H", indicating that Louise was from Salem, New Hampshire. Lucie Tenney, signed at Putnam Free School, Class of 1858. Middle initial might be T or S.
Olive A. T., signed at Newburyport, Massachusetts, on April 29, 1857. Sarah E. Corliss' notes: "1858" and "Towle", so the signer was presumably Olive A. Towle, who was in the Class of 1858 with Sarah. B. W. Sarah E. Corliss' note: "Webster", so presumably the signer was B. Webster. Lizzie, signed at Salisbury, Massachusetts, on January 28, 1857. Sarah E. Corliss' note: "Webster", so the signer was presumably Lizzie Webster. Susan H. Wilkins of St. Johnsbury, Vermont, signed at Putnam Free School on September 18, 1857. Sarah E. Corliss' note: "1858", meaning presumably that Susan was in the Class of 1858 with Sarah. Jennie R. Wood, signed at Putnam Free School on July 1, 1858; Sarah E. Corliss' schoolmate. Sarah E. Corliss' note: "1858", so Jennie was in the Class of 1858 with Sarah.